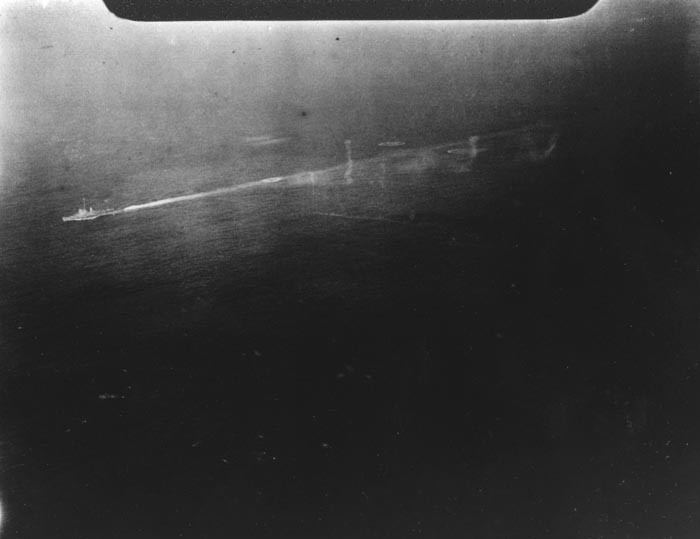 In the image above, Destroyer USS Fessenden searching the area with a large oil slick whilst Depth Charges are dropped. 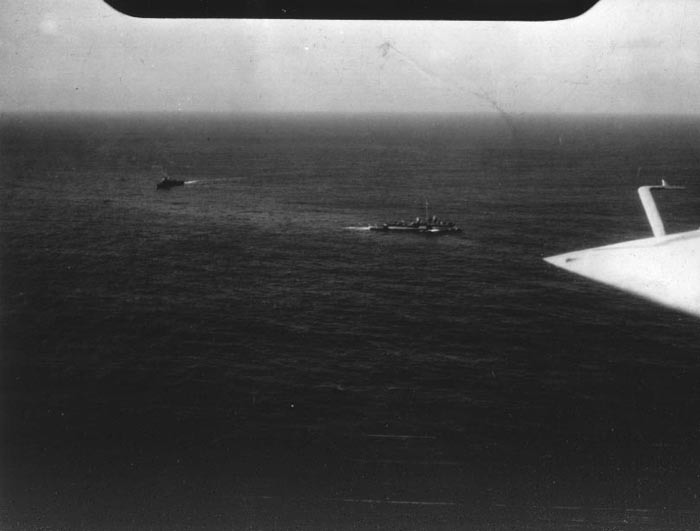 Large oil slick is seen in the area where U-1062 was sunk. Made contact at 1000 yards. Range closed to 600 yards before contact classified as definitely submarine. Contact maintained and range opened to 1600 yards to make hedgehog attack. At 1200 yards, range rate 10-1/2 knots, no doppler traces indicated beam attack, sharp metallic echo. As range closed range rate decreased to 9, 8, 7 and finally 6-1/2 knots just before contact lost at 330 - 340 yards. Doppler went from no doppler to down doppler at the end of the run. Sound operator reported wake between ship and target at about 500 yards. Wake on left side of recorder trace bore this fact out. Traces on recorder indicated beam target at beginning of run and also showed change to quarter and stern target. 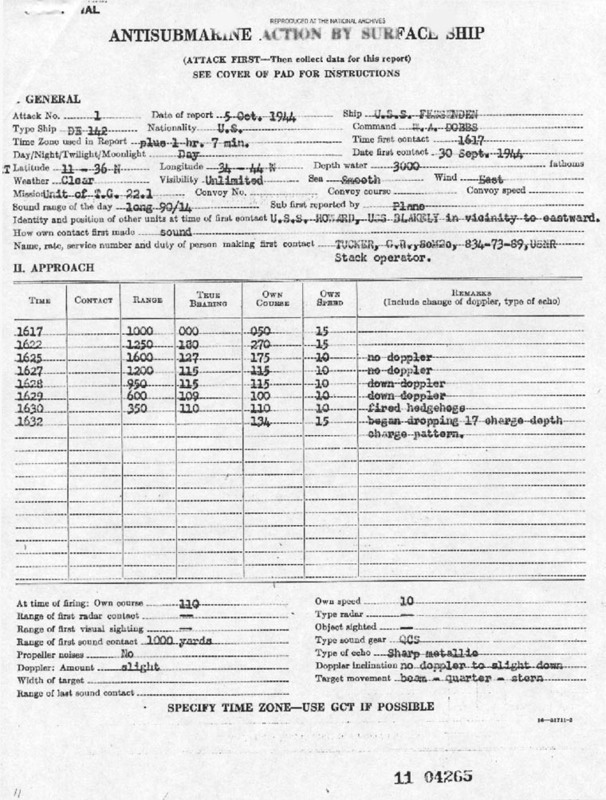 Firing time obtained from recorder. Four hedgehog detonations were heard 14 seconds after hedgehogs hit water. After the detonation, a large upheaval of water was observed in the center of the hedgehog pattern. Since this seemed to be a stern chase a 13 charge magnetic pattern was set and rolled from the racks and projectors, four additional charges all set on magnetic were also rolled from the racks. Firing of depth charges began as ship passed over hedgehog explosion point. Engine speed had been increased to full. Two depth charges exploded prematurely, one at 200 feet, about 3 exploded at depth from 400 to 500 feet, the remainder very deep. After searching point of explosion, observant search was begun. There was no immediate visible evidence of damage, nor was contact regained. At 1830 plane reported an oil slick near the point of attack. A large oil slick about 1000 yards wide and two miles long was observed in the immediate vicinity of the attack the next morning. The location of this slick never changed for the next six days and the oil could be seen as it came to the surface in small globules spreading immediately to about 1-1/2 to 3 feet in diameter. Continued search by the ships and planes using sonobuoys, was carried out during the six days. Sound contact was never regained and the area was searched again and again during which time sound conditions ranged from good to excellent. 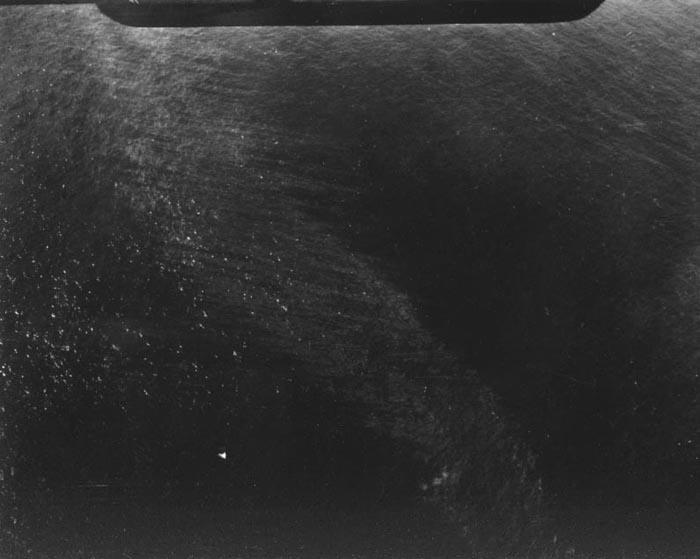 About 250 depth charges were dropped on and about the oil slick during the six days with no visible results. However, the oil slick was always there in the same locality, always just as thick as the preceding day and always could be seen coming up in the eastern edge. Radar contact was never made after the attack. Various noises were heard on the sonobuoys which were not definitely identified. An accurate navigational fix placed the oil slick at 11 - 40 north 34 - 39 west. It is considered that a submarine was sunk in this area.